The other night I started watching Friday Night Lights. Now, I’m not a sports person, and we just didn’t have that sort of sport spectacle at my high school, with the marching bands and the cheerleaders. In fact, we didn’t have a football team at all (we did have a bunch of other sports, but I didn’t really know anyone that was involved). But I am a longtime Kyle Chandler fan (from Early Edition! ), I’m always looking for something new to watch, and my Twitter friends assured me that it is a really great show. So now I’m hooked. I borrowed the first season DVDs from my cousin, I get to sit on the couch which is heated by the heating register below, and I knit on my Diva sweater. 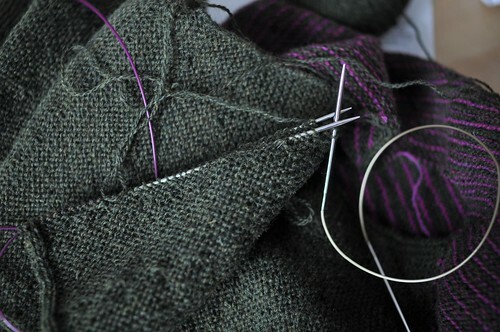 The construction is very interesting, but it makes for some unwieldy knitting! Just bound off the collar, which is constructed in two halves that meet at the back of the neck. Just need to sew in the sleeves and give it a good wet blocking and it’ll be ready to wear! It’s pretty chilly out (-15C, 4F) and there’s a fair amount of snow on the ground. I’m wearing an old Malabrigo worsted sweater and my cashmere Beauchamp Cowl, I just finished a cup of hot chocolate and I’m nice and toasty. Turns out that wearing a cashmere cowl indoors really helps with the warmth factor! All I want to do these days is cast on for more things. But I have so very many things on the needles already! 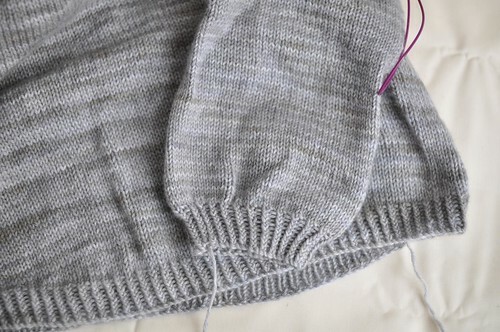 My cashmere sweater from the last post is ready for the sleeves and body to be joined at the underarm, but of course I went and started another one. I really want new sweaters, NOW! I know if I just kept on with one project I’d be much more likely to finish it quickly and have something finished. But that just isn’t how it works around here, ha. This black sweater is a compound top-down raglan, with a v-neck. I think it’s going to be a wrap sweater, since I have plenty of yarn. It’s a lovely many-plied blend of silk and cashmere, which I’m knitting quite tightly since it will grow considerably when I wash it. The only downside? 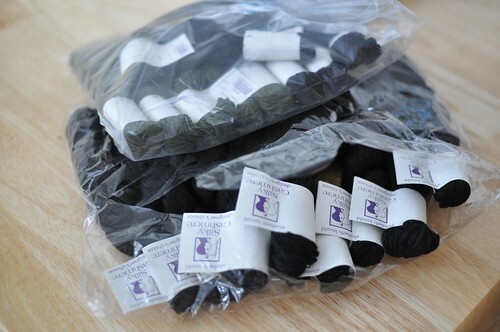 It comes in 25g skeins. It’s worsted weight. 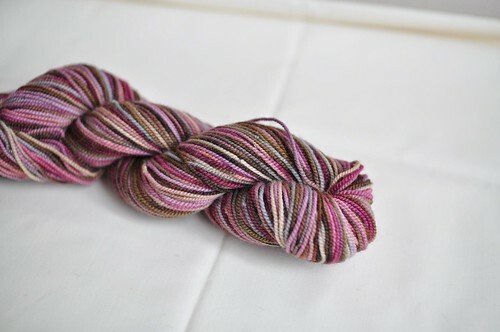 So there’s only about 45 yards per skein! I’ve not even been balling up the yarn, I just sit with the loop of yarn open on my lap or my desk, and knit straight from it. I suppose an upside is that I feel like I’m getting through a lot since I can knit up a skein in a sitting? Still, that is a heck of a lot of ends. (I tried the Russian join for one, but it just didn’t really work out very well with the structure of the yarn. I’m planning to just do my usual join and try to weave in the ends in small batches as I go.) The sweater up to where it is in the photo is, I think, 5 skeins. As every knitter knows, the most difficult packing task is deciding on the knitting – how many projects, how much yarn, and what if you need that tool you hardly ever use? What if you RUN OUT OF YARN? 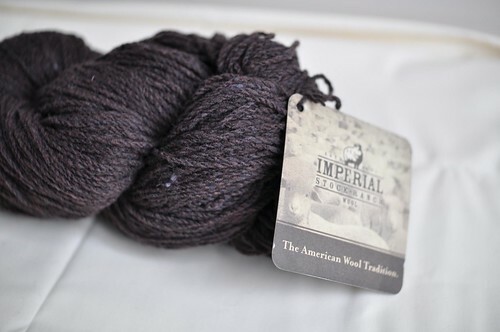 A plainish pullover in some silvery grey Handmaiden 4ply 100% cashmere. 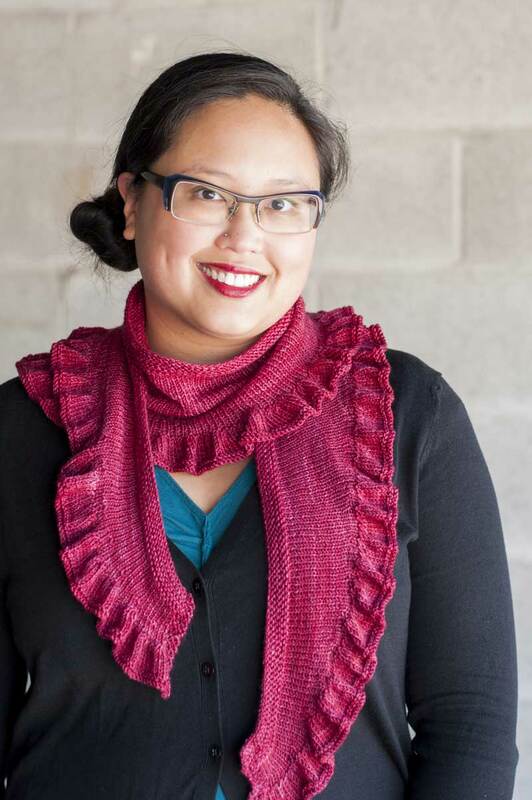 Canadian representation, easy to knit while chatting and drinking, and oh-so-amazing. I got a good chunk of the sweater done while I was away. 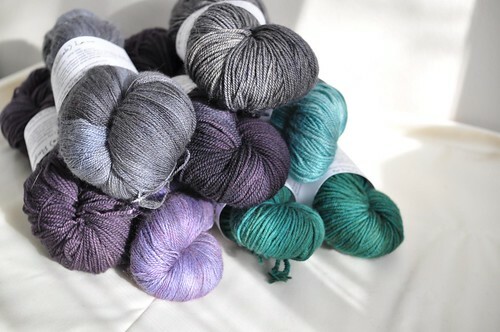 My only concern is that I only have 5 skeins of the yarn, and they’re only 50g each! I’ve knit a sweater in this yarn before, and I used 6 last time – but cashmere grows a fair amount with washing and wearing, and I think for this little sweater I should be fine. I’m almost up to the underarm with just 2 skeins, and the 3/4 sleeve I finished this week at home took about 40g. By my calculations, I’ll have about 70g, or more than 25% of the total yarn to use for the yoke. 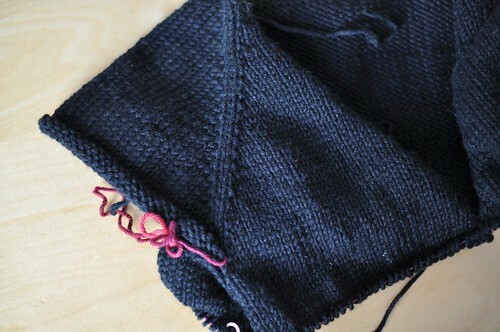 The second sleeve is my toss-in-my-bag knitting now. If you’ve been reading this blog awhile, you miiiight remember that I originally started this shawl on my big trip to Asia in early 2009. Although looking back through my archives, I can’t remember if I actually posted about it. Anyway, I worked on it a bit then, and a bit when I got home, but then I put it down in favour of worky design stuff and because I didn’t really have the knitting energy left over to work on a project that requires a little more concentration and a lot of chart reading. I’ve decided that I will get this shawl off the needles soon, preferably earlier rather than later, so I took it for the 5 hour plane rides between Toronto and LAX. I figured I might actually put in some time on it, and I managed to get through about 1.5 of the charts. I was even able to watch some movies on the plane and knit the shawl at the same time. 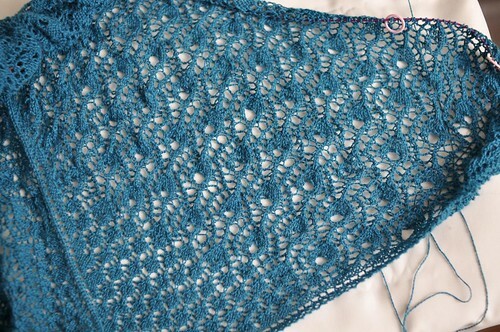 There are 7 charts for the body of the shawl, and then a big edging one. I’m about halfway through chart 6, and while the end might not quite be in sight yet, at least it’s looking like I’ll be able to finish it! I’m knitting it in some laceweight cashmere that I bought a couple of Rhinebecks ago, on 2.25mm needles. The pattern calls for 3.5mm, but I want it to be smaller than 88″ across the top. So far it looks like it isn’t going to be enormous, so I’m pleased. But it might be difficult to keep working away on this since I came back with so much lovely yarn that is tempting me towards some new projects.